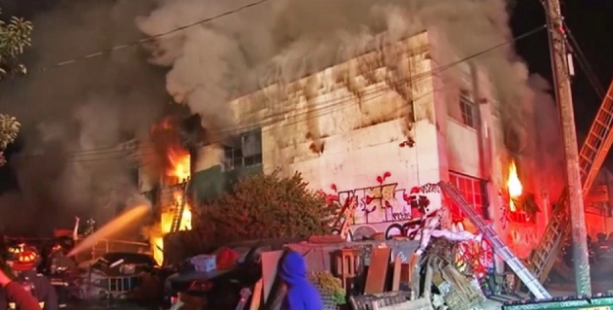 OAKLAND, Calif. -- Authorities in the San Francisco Bay Area say they are prepared to deal with up to 40 deaths after a blaze broke out at a warehouse party in Oakland, California. Police: We'll be at Oakland warehouse fire scene "for days"
Alameda County Sheriff’s Sgt. Ray Kelly said on Saturday that nine people were confirmed dead, and that he expects that number to rise. Oakland Fire Chief Teresa Deloche-Reed said some people escaped, and that between 50 and 100 people were at the warehouse at the time of the fire. She said the warehouse was subdivided into artist studios and was packed with furniture and other objects, which would have made it hard to escape in an emergency. The blaze began around 11:30 p.m. on Friday in an industrial neighborhood of Oakland called Fruitvale. It tore through the building during an event featuring musician Golden Donna’s 100% Silk West Coast tour, the East Bay Times reports. It remains unclear how the fire started. Kelly said there will be an arson investigation, although he added that there is is no reason to suspect arson. Officials said they need to investigate for all possibilities. “Something as simple as cigarette could cause a fire that could lead to something like this,” Kelly said at a press conference late Saturday morning. CBS News Justice Reporter Paula Reid reports that the Bureau of Alcohol, Tobacco, Firearms and Explosives has joined local firefighters to investigate. Authorities have not deemed the scene of the blaze a crime scene. Videos posted by Oakland firefighters on social media overnight showed thick plumes of smoke and swelling flames at the site of the fire. Fire officials said the building had no sprinklers, and Deloche-Reed said the only way out of the second floor was a makeshift stairwell made of pallets. She said the roof collapsed and there is a lot of debris that will have to be painstakingly removed. The majority of bodies, she said, were found up on the second floor. The East Bay Express reports there was a history of complaints about the building. “Habitability” complaints regarding an “illegal interior building structure” were made as recently as Nov. 14 against the property’s owner, city records reportedly show. It appeared that city inspectors went to the building on Nov. 14 but couldn’t verify code violations, the Express reported. A complaint was also made on Nov. 13 claiming there was “a ton of garbage piling up on the property” next to the warehouse, which, the Express reported, citing property records, is owned by a trust set up by Chor N. Ng of Oakland. The garbage included materials that were possibly “hazardous,” according to the paper. Also, in October 2014, the city had cited Ng due to structures being built without permits in the warehouse, the paper said. People used a Facebook page Saturday to post and seek information on family and friends who may have been in the building. The Oakland police urged those concerned about missing people -- or those who have information -- to call the Alameda County Sheriff’s Coroner’s Bureau at 510-382-3000. Kelly urged people not to call hospitals in the area looking for loved ones since they’re inundated with calls. He said authorities are in the process of recovery and identification, and that the interior of the building is difficult to access. “It’s just a task to get through the front door with all the debris and wreckage that’s there,” he said.